While climbing at Swiss Cottage on Saturday we starting chatting to guy who was belaying a couple of kids. Turns out he is setting off to Nepal tomorrow as part of an Everest expedition. 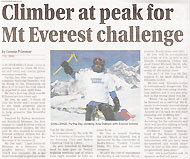 I promised Partha a mention on my blog and I’m sure everyone will join me in wishing him every success for his summit attempt and safe return. ← Previous Previous post: Crib Goch…..finally! Next → Next post: Excitement and Frustration!